← Is Tom Sullivan right? Is bipolar disorder a fad? Are there people on disability who shouldn’t be? Below are triggers that can cause a manic episode. It is important to be aware of your triggers. Knowing what your triggers are could help reduce your chances of getting manic. This entry was posted in Uncategorized and tagged bipolar disorder, mania, manic episode. manic. Bookmark the permalink. 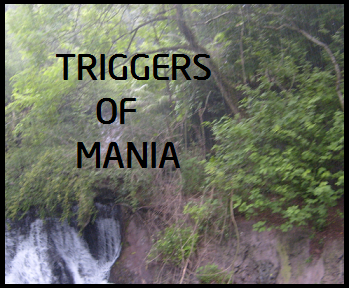 8 Responses to What can trigger mania? I agree that frustration can be one of them. For me it’s lack of sleep that sends me over the edge into mania and then psychosis which is just a real treat! I agree and can’t believe I left it out.